The increasing ubiquity of information technology in the past few decades has created a vast amount of data, capturing everything from society's shifting demographics to the planet's changing climate. In recent years the value of such data has been recognised - the shift towards 'open government', for example, has seen public bodies worldwide release their information for scrutiny by researchers, journalists and the public at large. But these data often come in great volumes and impenetrable formats. How can analysts uncover the trends that exist within large datasets that contain textual and numerical values, which may change dramatically over time? And once these trends are found, how can they be communicated to a wide and often lay audience? Data visualisation provides a solution. The advent of digital, interactive and online technology has made it possible to present and explore data graphically in new and compelling ways. Well-designed interactive graphics can act as data microscopes that help scientists and society see into the data deluge. 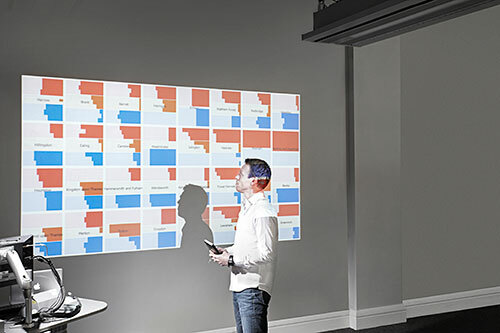 The giCentre is at the forefront of research and practice in data visualisation. It has published more than 55 papers in the field, which have been recognised through multiple awards at leading national and international conferences such as IEEE VisWeek and GIS Research UK and published in pioneering works, including O'Reilly's Beautiful Data (Dykes, J. and Wood, J., 2009. The Geographic Beauty of a Photographic Archive. In: Segaran, T. and Hammerbacher J., eds. Beautiful Data. O'Reilly) and Wiley's The Map Reader (Dykes, J. and Wood, J., 2011. The Geographic Beauty of a Photographic Archive. In: Dodge, M., Kitchin, R. and Perkins, C., eds. The Map Reader: Theories of Mapping Practice and Cartographic Representation. Wiley Blackwell). The Daily Telegraph and the Guardian have featured giCentre visualisation, as have specialist publications such as Infosthetics and Panlibus. As part of City's Department of Information Science, the giCentre has its roots in geographic information (GI), which has filtered through to its visualisation work. Jason Dykes, Professor of Visualisation (pictured on previous page), explains: "The team's focus is on developing, applying, and communicating with interactive graphics. The data we explore often have a geographic component and we employ many mapping and cartographic techniques. We do so in a wide range of industries and academic disciplines." The giCentre has been involved in a long-running collaboration with British local authority, Leicestershire County Council (LCC), supported by the UK Government's Department for Communities and Local Government, and the Economic and Social Research Council. With the public sector facing unprecedented cutbacks in the wake of the recession, it has become increasingly important for local authorities to understand how residents use their services and engage them in the assessment of whether limited budgets are being spent in the right places. The giCentre has helped LCC to do just that, by creating an online resource that enables its staff and residents to understand and share the results of a survey of 8,000 local people on service provision. The resource is publicly available at www.lsr-online.org/placesurvey. It visualises public satisfaction with the services and amenities that are offered by the authority and partners such as the police or National Health Service. It allows the responses of residents with different characteristics and those from different places to be compared and contrasted visually, providing deep analysis through an intuitive graphical interface. LCC's Research Manager, Robert Radburn, says: "Data visualisation is one method through which we can create more openness, giving our residents a greater understanding of what the Council is doing in their immediate locale and enabling them to hold us to account. The expertise that we're developing with the giCentre is groundbreaking in terms of local authority practice and is having a wide impact in our organisation." Another giCentre partnership is with the Willis Research Network (WRN) - a collaboration between academia and the insurance industry that focuses on evaluating the frequency, severity and impact of major catastrophes. Working with the University of Reading's National Centre of Climate Science, Dr Aidan Slingsby, a Willis Research Fellow in the giCentre, has developed a tool that visually analyses centuries of global storm activity and helps insurers assess the financial impact of atmospheric risk and the effect of climate change on it. The tool provides easy access to thousands of simulated storm tracks, generated over hundreds of years, enabling climate scientists to validate and interpret their data more easily, and disseminate information to the insurance industry. Matthew Foote, WRN's Research Director, comments: "Communication of complex hazard and risk information is an increasingly critical part of insurers' decision-making processes. Tools such as those being developed at City University London's giCentre are advancing the application of state-of-the-art technologies and the integration of world-leading science and risk management." The global storm activity work was acknowledged at IEEE VisWeek 2010 with the Discovery Award. 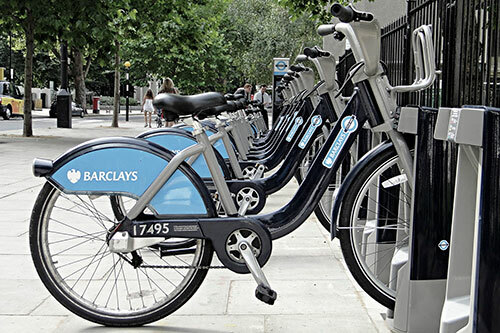 Closer to home, the giCentre's Dr Jo Wood, a Reader in GI Science, has been developing a number of visualisation applications based on data from the Transport for London Barclays Cycle Hire scheme. The scheme was launched in summer 2010 and enables residents and visitors to hire bicycles from docking stations around London. Dr Wood says: "Our visualisations provide several functions: showing the availability of bikes in the last 24 hours at each pick-up and drop-off point; tracking and simulating bike journeys; and highlighting how factors such as weather and day of the week affect usage. Such analysis will be critical to any future changes or improvements to the scheme." Summary of five million bicycle journeys made in 2010/11 in central London as part of the Barclays Cycle Hire scheme. Origins and destinations of each journey recorded and animated along a curved trajectory. This animation shows the effect of changing the length of the 'trail' left by each journey (starts to increase from 15 seconds into the animation). By changing the prominence given to more common journeys (from 45 seconds onwards), structure emerges from the apparent chaos of journeys. Three major systems become apparent (from 1 minute onwards) - Hyde park to the west, commuting to/from King's Cross St Pancras to the north and Waterloo to/from the City to the east. The giCentre is firmly committed to sharing its expertise. It has developed and released a series of utilities that are available free of charge and can assist researchers in creating data visualisation applications using Processing - an open-source programming language. It has also created the Hierarchical Data Explorer (HiDE) - software for exploring categorical data using hierarchical graphics with different orders, sizes, colours and layouts. This provides the microscope that can help to reveal different aspects of the data. It has already been put to effective use at workshops and 'hack days', enabling researchers to undertake quick analysis of trends in information such as London crime statistics or voting in the US presidential and London local elections. Professor Dykes concludes: "Data visualisation has the ability to help so many people: a business looking to understand its customers; a public body trying to improve its provision for citizens; or researchers seeking to spot new trends in complex scientific data. "Our aims are to develop the knowledge and tools that can assist all of these activities, broaden the array of collaborators we work with and help people make use of data through accessible interfaces that support effective analysis and communication."